Tiny Shrimp means "many" shrimp in our convenient glass jar. Packed to the brim, fully cooked and ready to eat straight out of the jar. 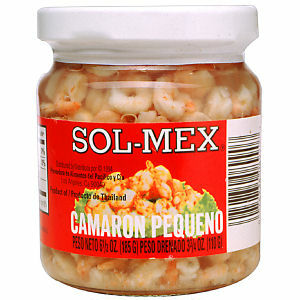 Sol-Mex tiny shrimp is also great as a key ingredient to fried rice, Mexican rice, or any seafood dish, such as "7 mares soup". Packed with great pride and care for your enjoyment. Sol-Mex quality is unconditionally guaranteed.